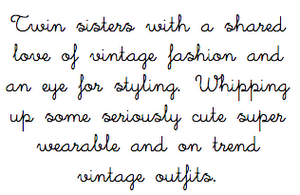 Every week when styling up out vintage outfits there is always a few items that we wish we could really keep. This gorgeous cream gold studded blouse was definitely one of this week favourites....but if we kept everything we loved there would be nothing left to sell....and that kind of defeats the purpose huh. So the blouse ticks all our style boxes...why?...first of all us Annie's are suckers for a statement collar and this collar has lots statement about it. It not only has shimmer metallised embroidery in a gorgeous swirl pattern it has the cutest rectangle studs which define the collars cutesy peaks. As if the collar wasn't enough the twin front pockets add to the blouses charm with the same gorgeous detailing. Oh and for the cherry on the cake....it has chunky rope like gold buttons. If this blouse was a cake we'd definitely eat it. Here we've teamed it with a light weight gold shimmer blazer, mid wash denim shorts, black knee highs, Chelsea boots and leather satchel for an on trend vintage day look. What do you all think?